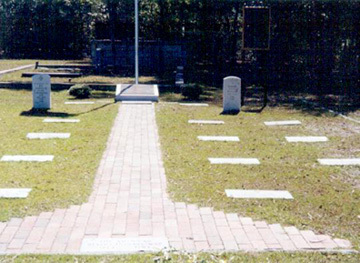 For over two hundred years forty-eight soldiers from Delaware have lain in unmarked graves near Camden South Carolina. The battle in which they lost their lives is described see "The Sacrifice of Delaware's Continental Regiment". A group of SAR members researched the records to determine the list of names for the marker. 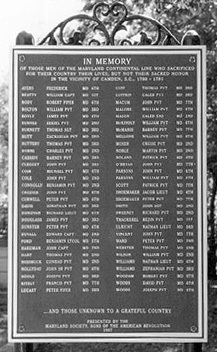 At the request of the Delaware Society, Sons of the American Revolution, David Sokola, Delaware state senator from the Newark area, introduced a motion in the Delaware senate to provide state funds for casting a marker commemorating the Delaware Continentals who died with General de Kalb and about sixty Maryland Continentals in the disastrous first battle of Camden, South Carolina, during the Revolutionary War. C. Russel McCabe, chair of Delaware's Historical Marker Commission (and a member of the SAR) installed the marker for the unveiling ceremony on 1998 Nov 7. Walter Barron and Merrill Reich, both of the Gen. Thomas Sumpter Chapter SCSSAR, were most gracious in making arrangements for the ceremony. Eight members of the Delaware Society SAR were present, and most participated in the ceremony. The Delaware State Society, DAR was also represented. The 130-person audience renewed their dedication to liberty and independence. The musket squad fired a thirteen-shot salute. Map of the region (NC, SC, GA); airport closest to Camden SC is at the plus symbol (+). Map of the local area showing the battle area north of Camden. The town of Dekalb (just off the top of the map) was named in honor of the patriot Major General Johann de Kalb, who died of wounds several days after the battle. The town's name is written Dekalb, but the General's name is written de Kalb. 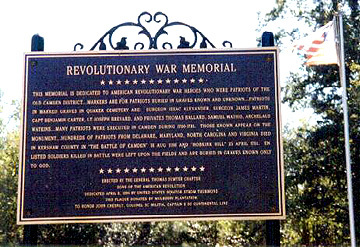 Since the battle site in Dekalb is subject to vandalism, the Revolutionary War memorials related to that battle have been placed in a protected historic district in the city of Camden SC. Map of Camden showing the historic district. Several Web sites describe the Historic Camden Revolutionary War Site. Map of the Camden Historic District, showing the Rev. War cemetery at lower left in the outlined box to the right of the T intersection. 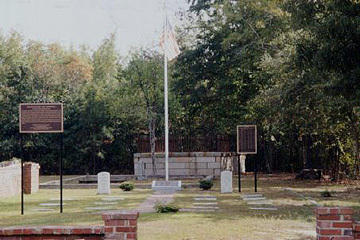 The whole cemetery, showing the Revolutionary War marker in front at left and the Maryland memorial marker in back at right. The Delaware memorial marker was placed in back at left. Walkway through stone markers for Rev. War patriots from South Carolina.